Passengers on an amusement park attraction in California were trapped 300 feet in the air for more than three hours when the ride they were on malfunctioned. NBC's Diana Alvear reports. Updated at 7:59 a.m. ET: Nearly two dozen riders were safely returned to the ground Wednesday night after having been stranded hundreds of feet in the air for more than three hours on a ride at Knotts Berry Farm. The Knotts Berry Farm Wind Seeker stopped working around 4 p.m. when the ride's "safety security system activated," causing it to come to a halt, park officials said. Twenty riders were stranded about 300 feet in the air near the top of the ride, according to Jennifer Blazey, spokeswoman for the park. By 7:30 p.m., the ride had been manually lowered about half way to the ground. At 7:40 p.m., the group -- which appeared to range in age from teenage to adult -- walked off the swings. The Buena Park ride also became stuck on Sept. 7. That time, it took three hours for maintenance crews to manually lower the ride. "Safety is Knott’s number one priority and we are committed to the protection of all our guests. Each of our rides is inspected, check-listed and properly maintained daily. Knott’s will continue to consistently monitor and inspect the rides and operation thereof," the park said in a statement relreased Wednesday night. "The attraction will remain closed while Knott’s Berry further investigates the cause of the incident." 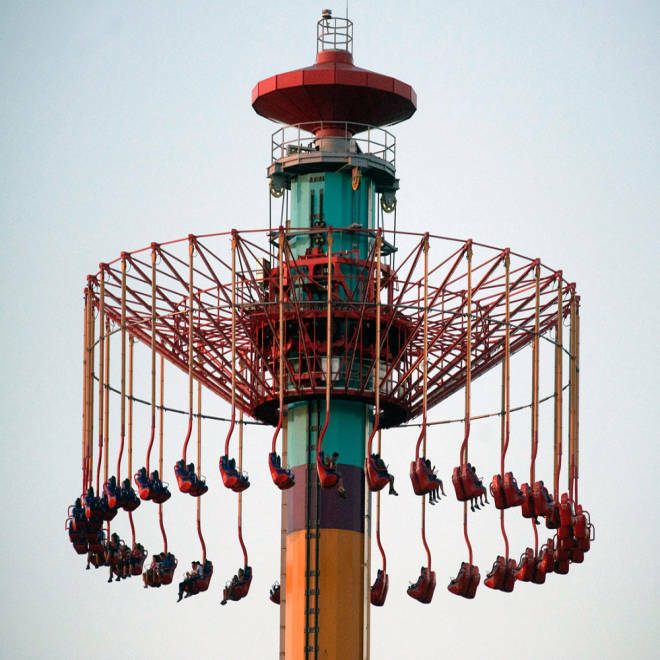 The ride has 32 two-person gondolas that go 301 feet in the air then swing riders for a minute at a 45-degree angle at eight rotations per minute, according to Knott's website. Knotts Berry Farm used its own maintenance crew to handle the malfunction. Orange County Fire Authority firefighters were not called to respond to the malfunctioning ride, OCFA Capt. Marc Stone said. Riders on the Wind Seeker ride at Knott's Berry Farm were stuck a few hundred feet off the ground on Wednesday.